A native white redbud underplanted with natives Virginia bluebells, May apples, and golden groundsel. This is one of my favorites times of the year: our woodland is at its peak and epimediums and emerging hostas fill our side hill. The almost 90 degree weather is moving the plants along quickly, but the native plants in our woodland are glorious right now, and I wanted to capture it on film. Nursery News: Appointments are still available for our primrose and hosta event this Saturday, May 5, from 9 am to 4 pm on the hour and half hour. To schedule an appointment, email your 1st, 2nd, and 3rd choice of times to carolyn@carolynsshadegardens.com, and I will confirm. The 2018 Mini Hosta Catalogue is on our website here, and we are taking orders for mail order and pick up at the nursery. Our third open house sale featuring hostas, mini hostas, hardy geraniums, ferns, and later-blooming shade plants is Saturday, May 19, from 10 am to 3 pm, rain or shine, cash or check only, directions here. Native Celandine poppies under white redbuds. Pine needle paths thread through our woods. Native Virginia bluebells and Celandine poppies under a ‘Waterfall’ Japanese maple. Native mayapples grow through ‘Alba Plena’ European wood anemone. 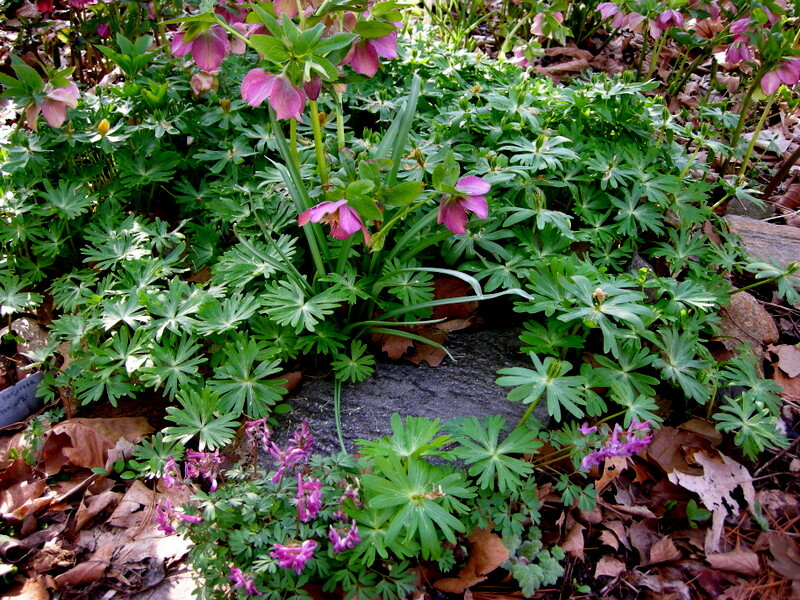 European wood anemones, like ‘Leed’s Variety’, fill in among the native plants in our woods. Pale yellow European wood anemone, Anemone x seemanii. Some of my favorite native plants make a cameo appearance right now: Tennessee form bloodroot.
. ‘Multiplex’ double bloodroot blooms for a much longer period than the single flowered forms. 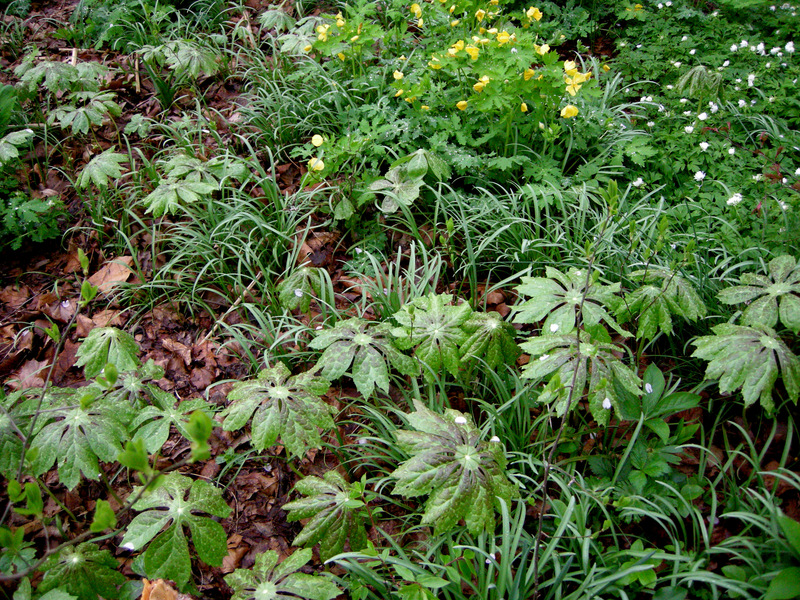 I let native Dutchman’s breeches seed around wherever it wants to go from our natural woodland to our formal hellebore beds. Pulmonarias are another plant that I allow to roam at will in the garden. Their seedlings take many beautiful forms. 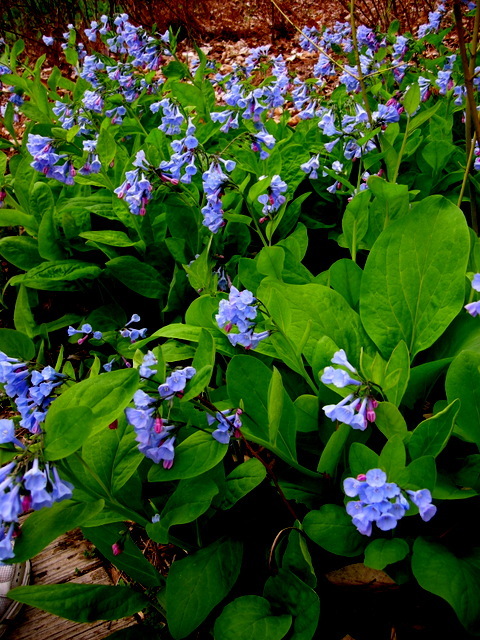 ‘Jack Frost’ perennial-forget-me-not or brunnera has strikingly beautiful true blue flowers and silver-frosted leaves. Many of its seedings also display silver leaves, and it does very well in the dry shade of our woods. 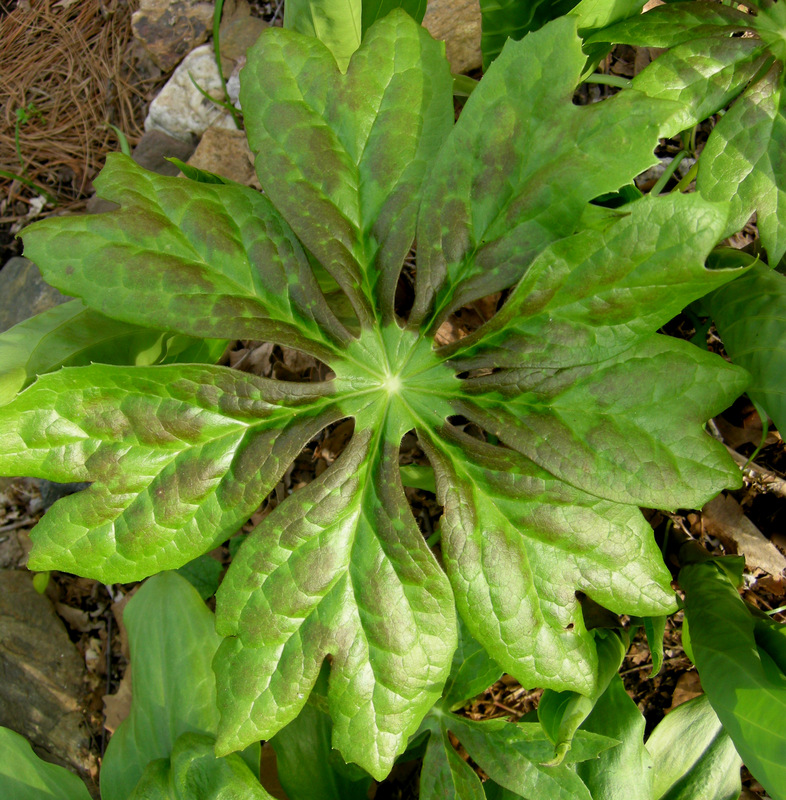 Another plant that does well in dry shade is Japanese woodland primrose. It goes dormant when it gets hot out so doesn’t care about our dry summers. Cowslip primroses are also not picky and grow at the edge of our woods in average soil. ‘Old Brick Reds’ primrose with white bleeding-hearts and native Celandine poppy. 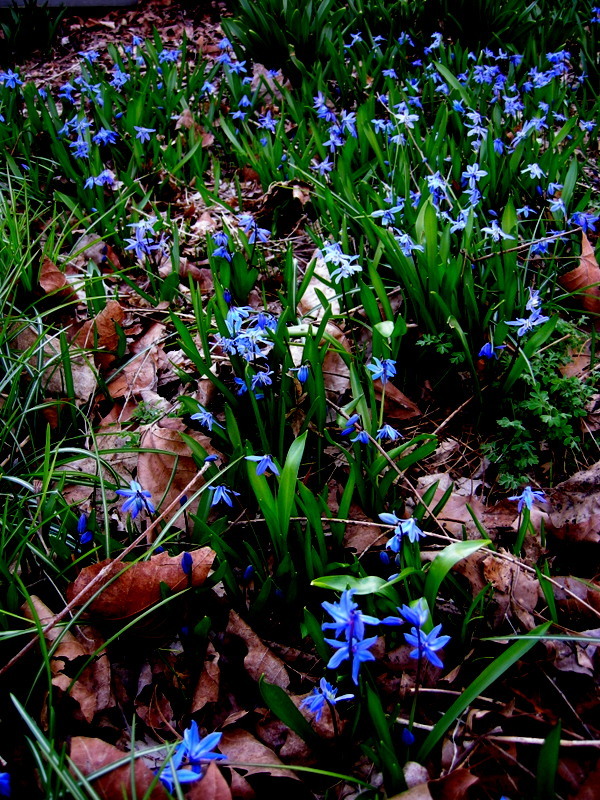 Grecian windflower is a startling shade of blue and seeds through our woods. 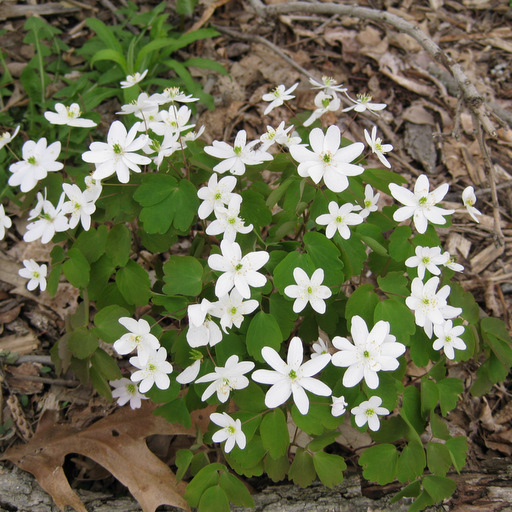 Delicate rue anemone prefers to grow in the rocks along our woodland paths. The extreme heat has forced our amazing ‘Black Tulip’ magnolia to the end of its bloom period. However, there are a lot of wonderful plants coming into their own right now. If you are local, I hope you can stop by tomorrow, Saturday, May 5, by appointment to shop and see our gardens, especially the woodland, in person. Just send an email requesting an appointment with some convenient times. Hellebores are in their prime. Here is a claret colored hybrid at sunrise. We have a wonderful selection of hellebores for sale right now. Apparently winter is over, although nothing could surprise me in the weather department this year. 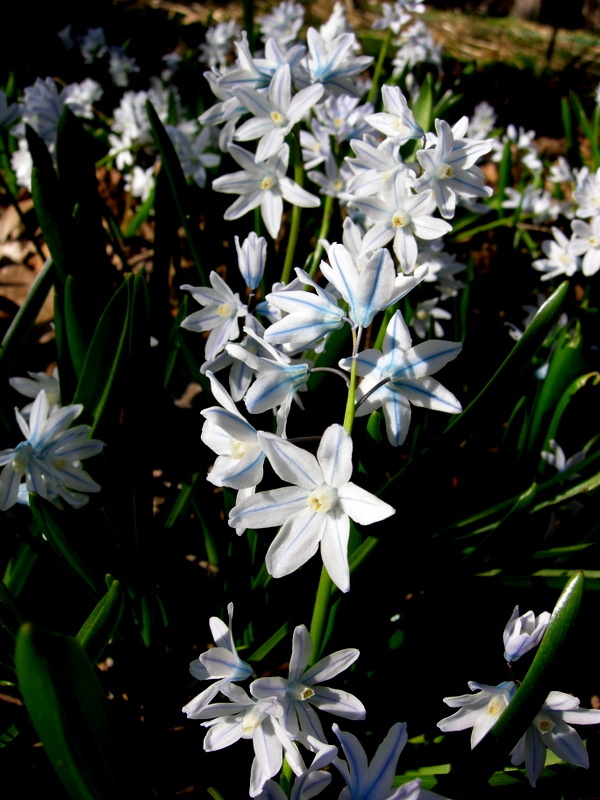 Last weekend when Kelly Norris, Director of Horticulture at the Greater Des Moines Botanical Garden, visited my gardens, the tour consisted of me pointing and saying “if it were really spring, you would be seeing….” Now the garden is bursting, please come back Kelly :-)! Bearsfoot hellebore, H. foetidus, stood up particularly well during the extreme heating and cooling and heavy snow that March threw at it. Lots of customers have been asking for these, and we have more in stock. ‘Goldheart’ old-fashioned bleeding-heart seems to appear overnight. It turns into a majestic plant with gold leaves and pink flowers, a combination I have grown to love.
. ‘Diana Clare’ pulmonaria’s large blue flowers look spectacular with its emerging silver leaves. Once you have a couple of varieties of pulmonarias, they start to cross and every one is beautiful. 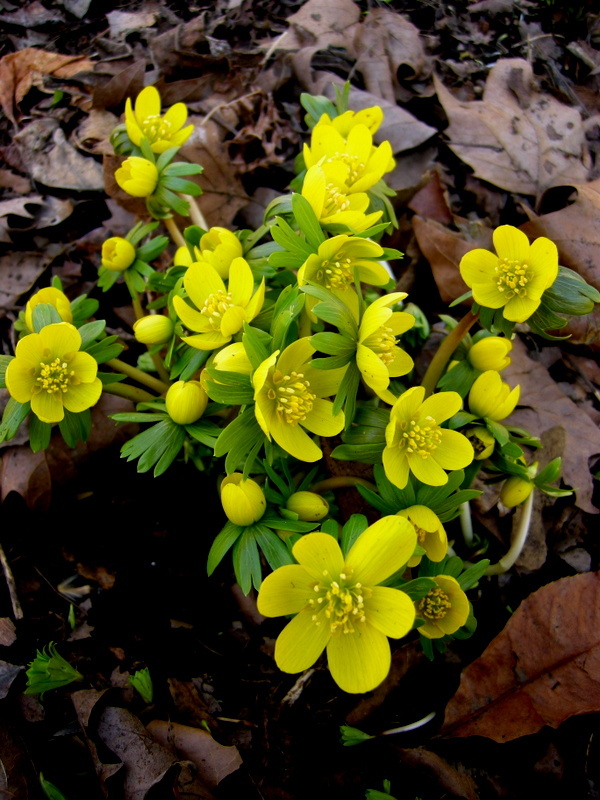 The lovely, pale yellow flowers of Anemone x seemanii were produced by a cross between A. ranunculoides and A. nemorosa, European wood anemones. Very rare and available at Carolyn’s Shade Gardens for the first time this year! 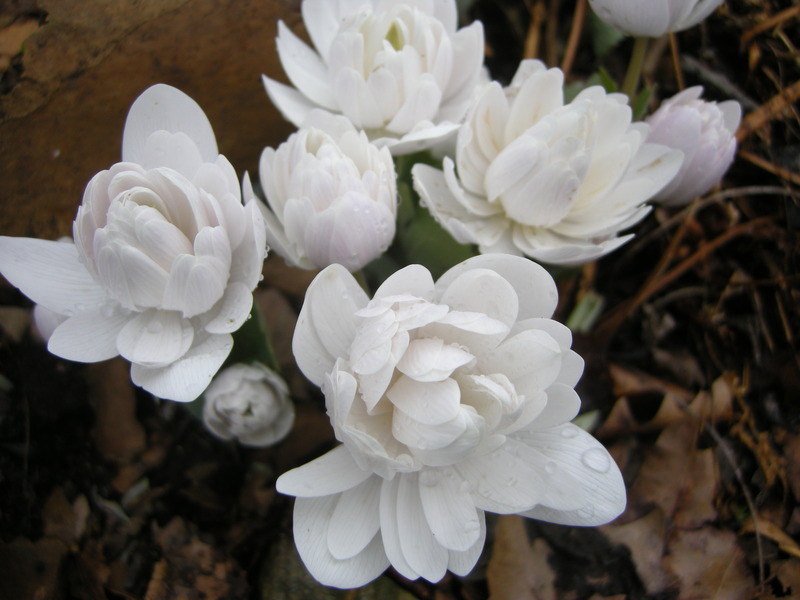 Our native double bloodroot, Sanguinaria ‘Mulptiplex’, is my all time favorite flower. It seems to prefer the rocky slope in my woodland, and I often see the single form on road embankments. We take special orders for this plant. Our display gardens have about forty types of epimediums, and their flowers are popping out of the ground. Here, the orange-flowered E. x warleyense. We will be selling this epimedium along with ‘Roseum’, ‘Niveum’, ‘Lilafee’, E. grandiflorum, and the rarer ‘Yubae’ (Rose Queen) and ‘Pierre’s Purple’. 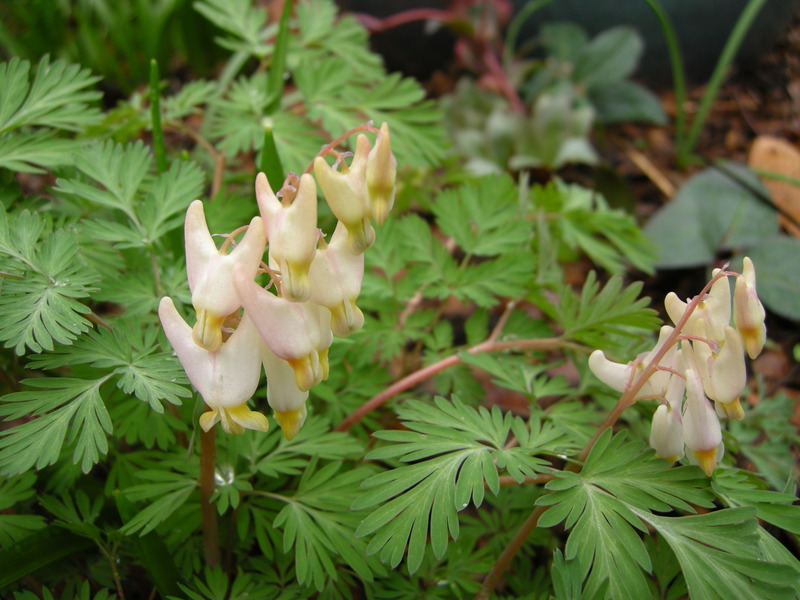 One of the first plants I ever planted and still a favorite: Dutchman’s breeches, Dicentra cucullaria. Available this spring. There are lots of dogtooth violets in our woodland and they have even crossed and produced some stunning new forms. 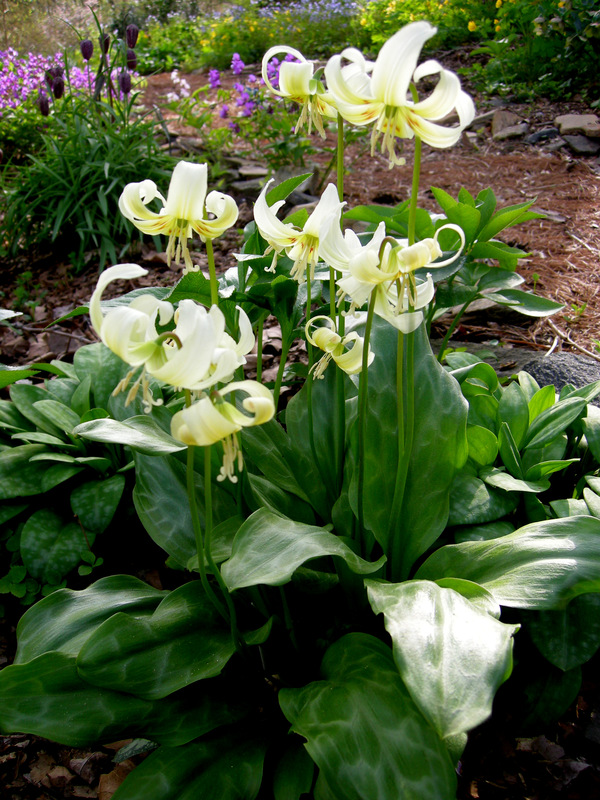 This is the European Erythronium dens-canis. Its flowers are gorgeous but sparse. We sell the US native ‘Pagoda’, a vigorous plant with many yellow flowers just starting to open. Everything is so late this year! Native moss phlox ‘Emerald Blue’ is just starting to open its flowers. 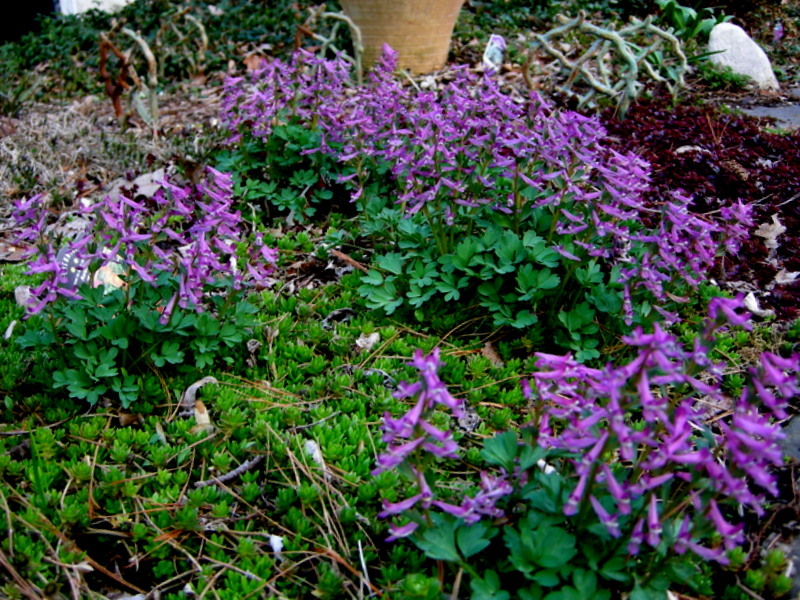 Moss phlox makes a great, evergreen groundcover in sun to part shade in dry areas. Ask us to point out our amazing stand of the white-flowered form ‘Nice n’ White’. We also sell purple, crimson, and a new, more compact cultivar called ‘Emerald Pink’ that looks like a miniature boxwood. ‘Shell Pink’ lamium bursts into bloom now but then continues to flower until December. 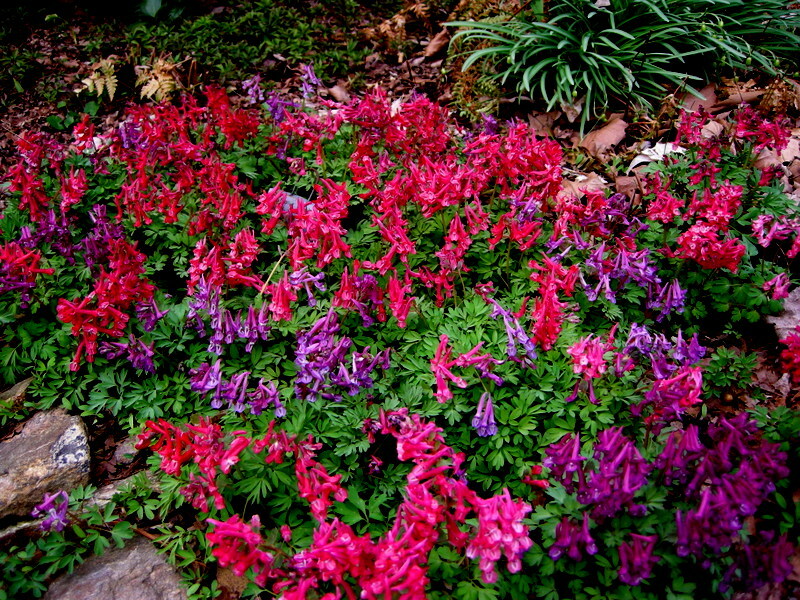 It is the only lamium that produces flowers for three seasons. Its leaves are also semi-evergreen so the ground is never bare. 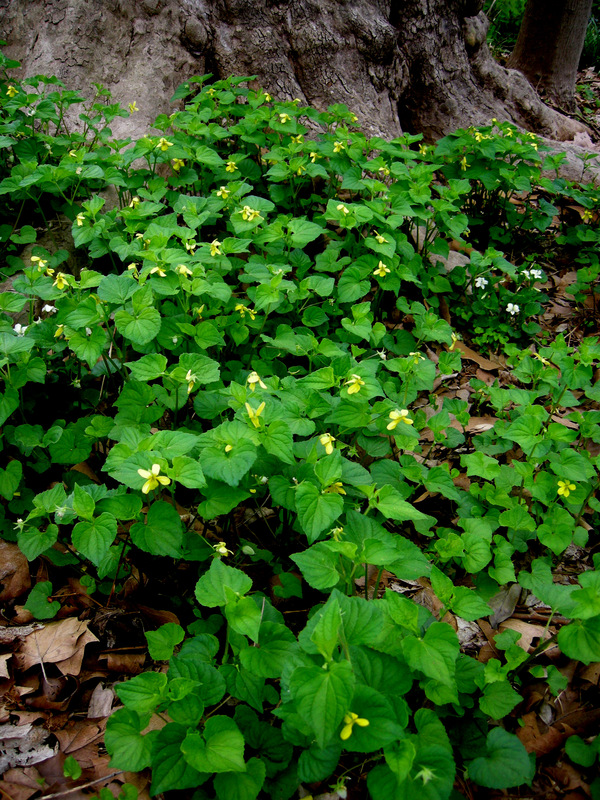 It is not invasive and should not be confused with the yellow-flowered lamiastrum. Anemone ranunculoides, a parent of A. x seemanii shown earlier, is a bolder color and faster spreader. 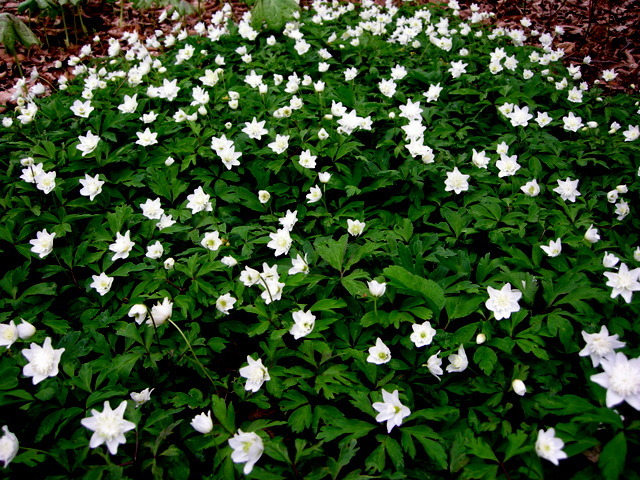 We also sell ‘Bractiata’, ‘Vestal’, ‘Alba Plena’, and ‘Wyatt’s Pink’ European wood anemones. 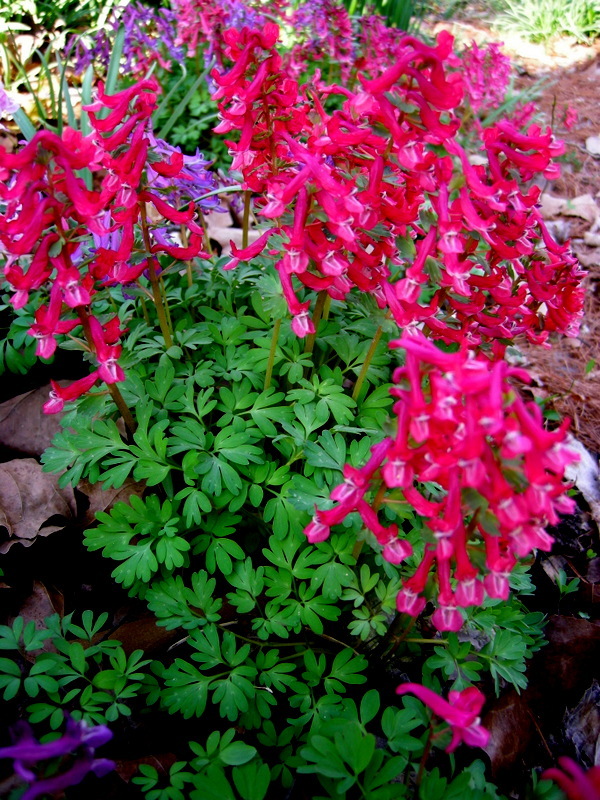 Now we get to one of my favorite plants, Corydalis solida, which you will see all over my garden in a rainbow of colors. Its common name is fumewort, but I never hear anyone call it that. The photo above shows the varieties that I sell: ‘George P. Baker’ in the foreground, ‘Purple Bird’ in the center, followed by ‘Beth Evans’, and ‘White Knight’ at the very back. ‘White Knight’ is new this year and is a stunning form, densely packed with pure white flowers. 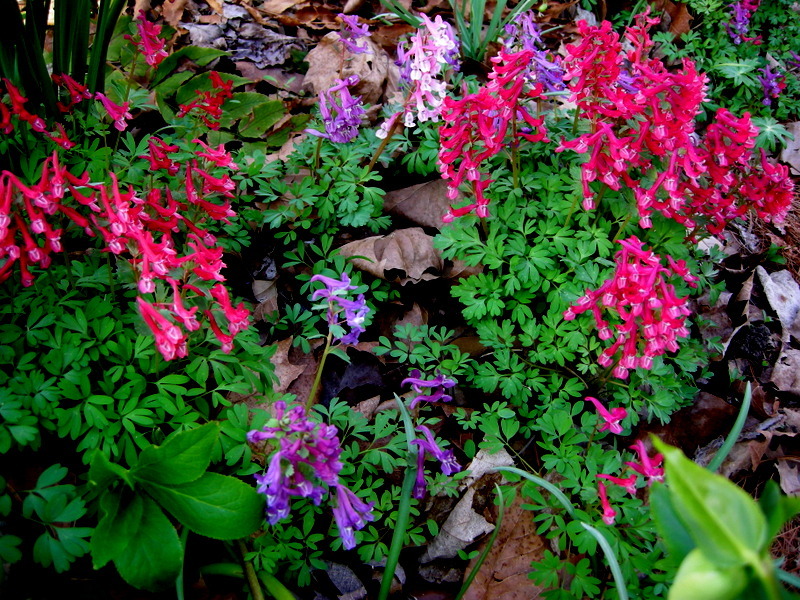 If you let Corydalis solida self-sow in your garden, you will get some gorgeous un-named forms like the blue above. 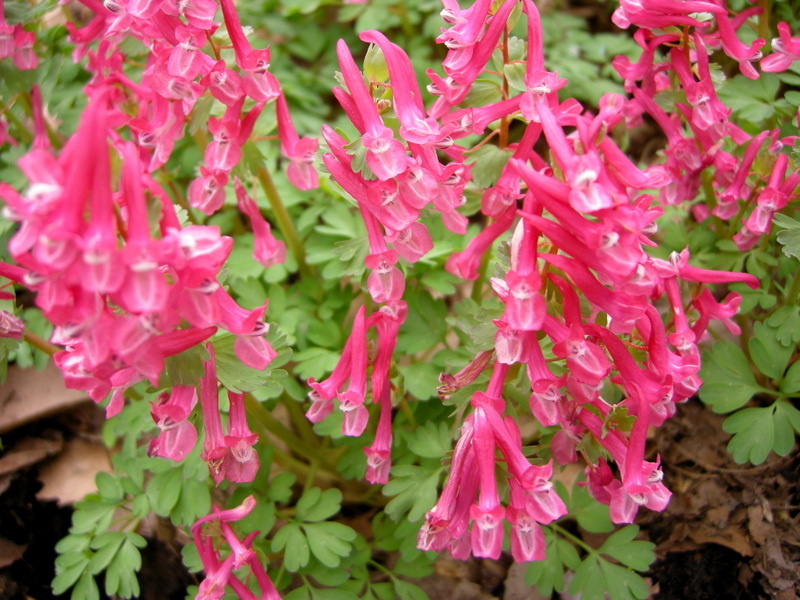 Unlike other brightly colored corydalis, fumewort comes back reliably every year. It goes dormant after it flowers but reappears bigger and better the next spring. If you are local and want to get a jump on the April 15 open house sale, we are around today, tomorrow, and all weekend. Just email for an appointment. Or come Saturday between 10 am and 3 pm when customers are picking up their edgworthias—let me know an approximate time. Who says our native mayapple, Podophyllum peltatum, is not as ornamental as the Asian versions? 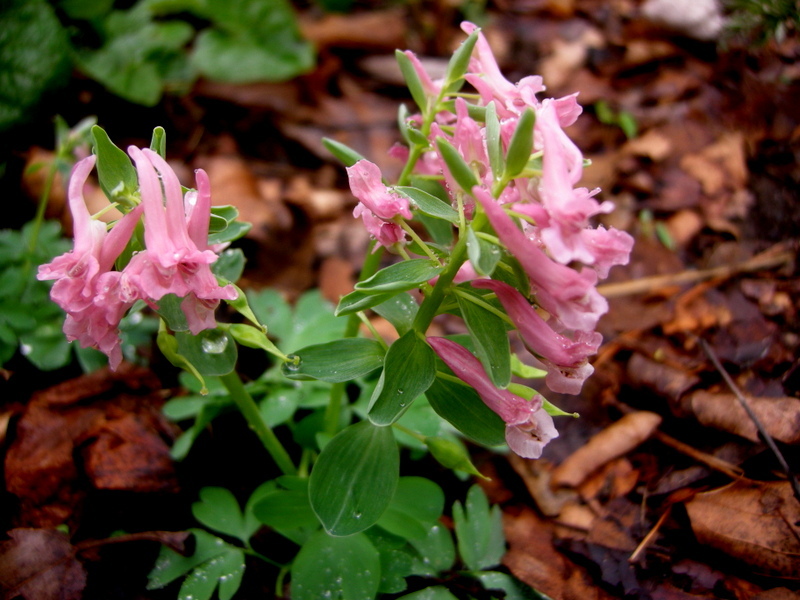 This is the last in a three-part series of posts dealing with native plants for mid-Atlantic U.S. gardens. 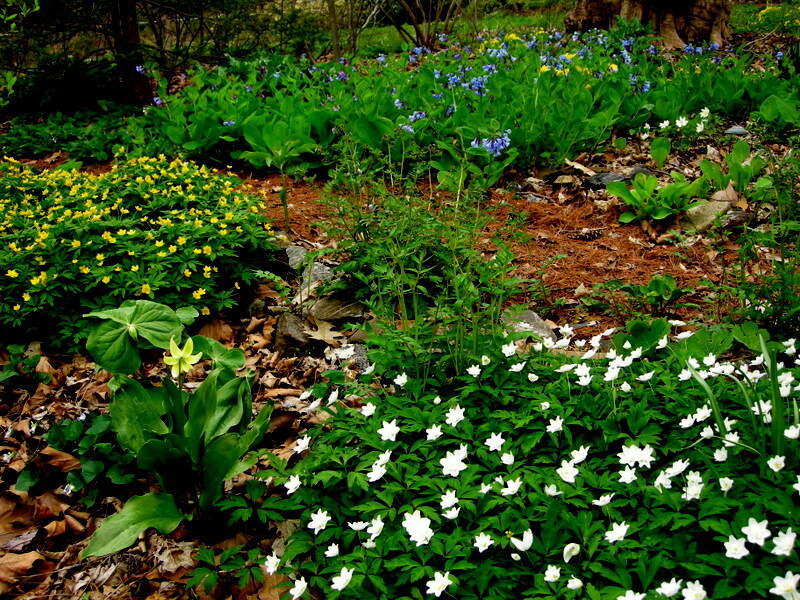 In the first, Your Native Woodland, I explained how easy it is to create your own native woodland garden by choosing plants that spread aggressively. In the second, Native Phlox for Your Garden, I profiled some of the wonderful members of the genus Phlox, all native to eastern North America and Pennsylvania in particular. 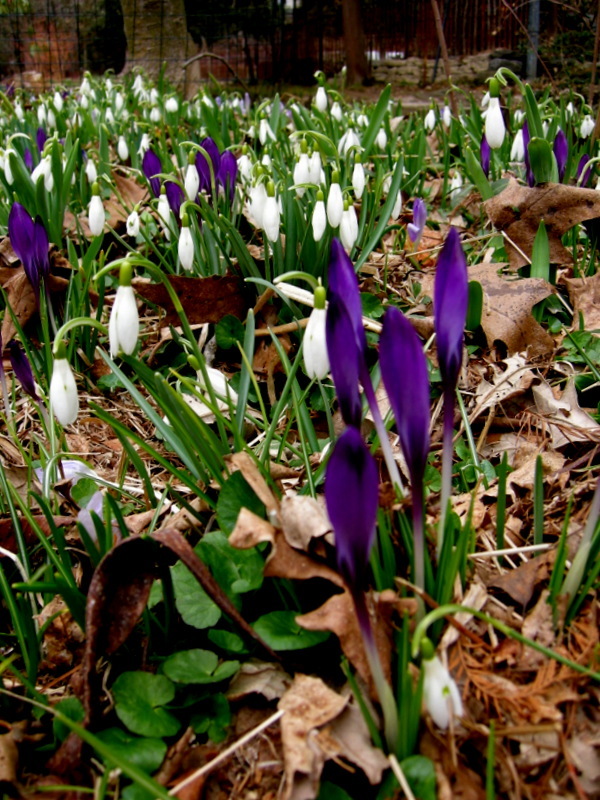 Here I am going to suggest some superstar native plants to place between the spreaders recommended in the first post. Double bloodroot, Sanguinaria canadensis ‘Multiplex’, just might be my all time favorite flower, and it thrives in my woodland. 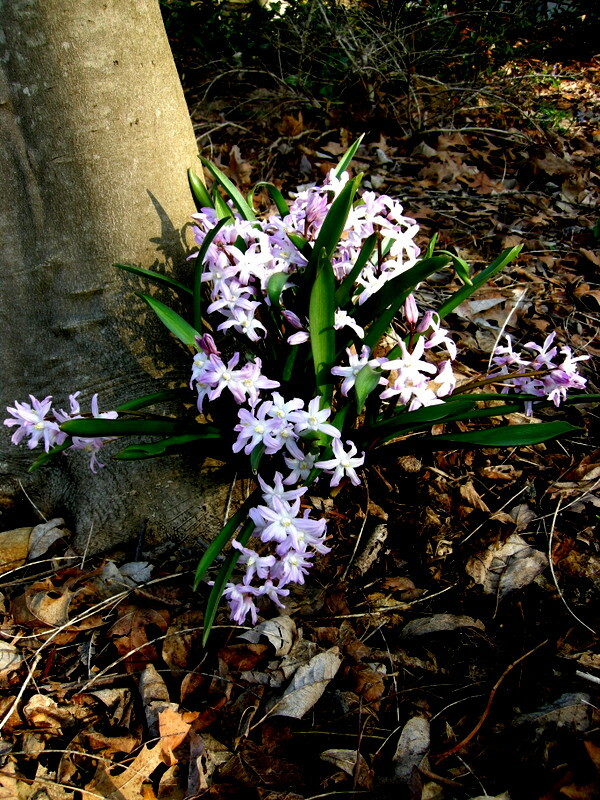 Let’s face it: none of us avid gardeners (and collectors) are going to be happy limiting ourselves to the seven spreading plants that I recommended in my previous post for colonizing a woodland. Although the gardening books seem to think we have moist, loamy soil in our woods, we don’t (where do these people garden anyway?). 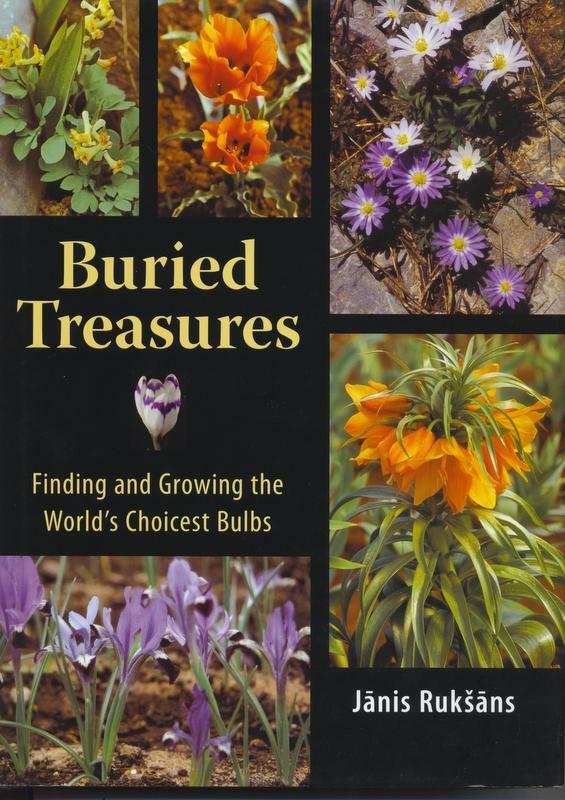 So what other plants can stand up to the root-filled, dry, rocky, clay soil prevalent in the woods of the mid-Atlantic? You will be happy to know there are many, and the plants shown below just scratch the surface. I have personally tested each one, and killed many others, so I know they work. 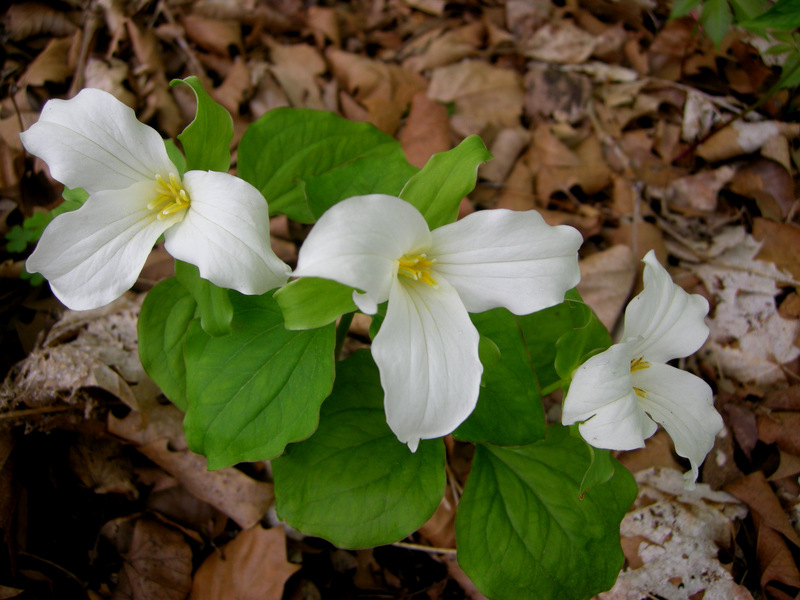 White trillium, T. grandiflorum, is one of the many native trilliums that thrive in my woodland. 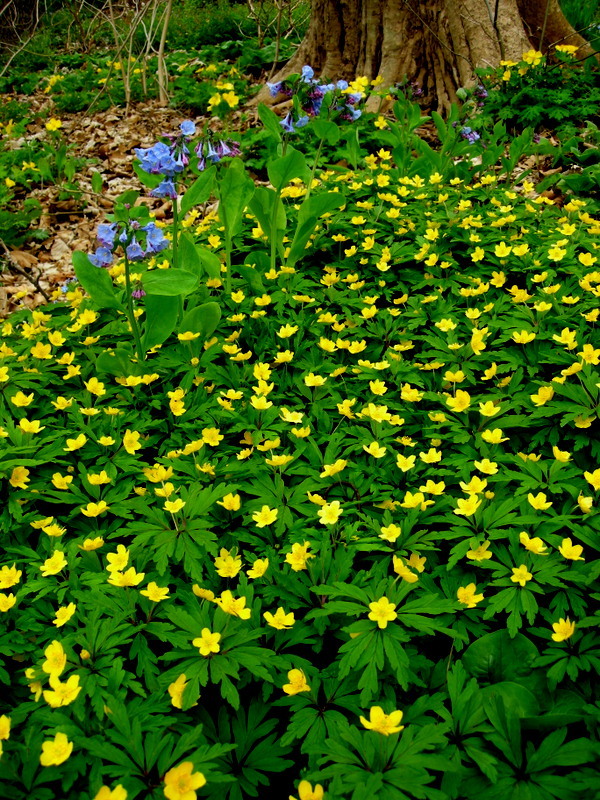 Sweet Betsy, Trillium cuneatum, also does well as do prairie trillium, T. recurvatum, and yellow trillium, T. luteum. 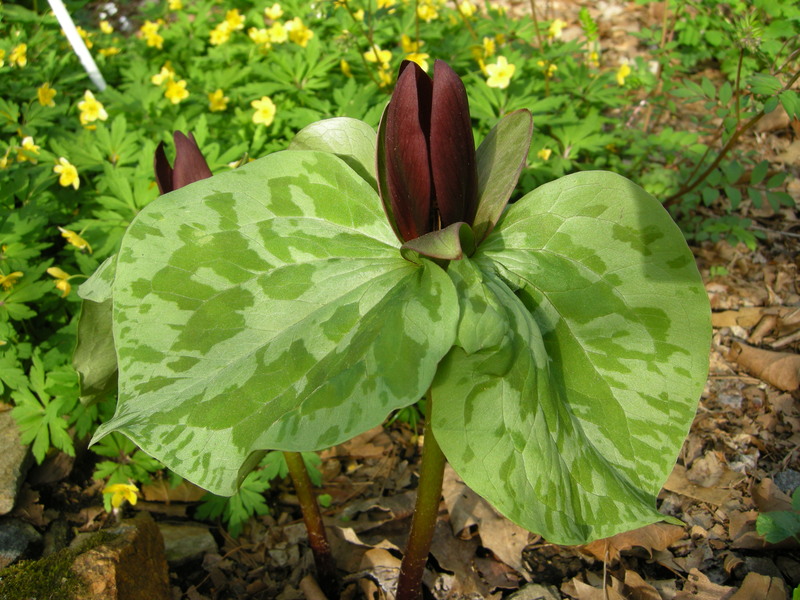 Although I usually do not water my woodland, I find that trilliums benefit from watering in drought conditions. 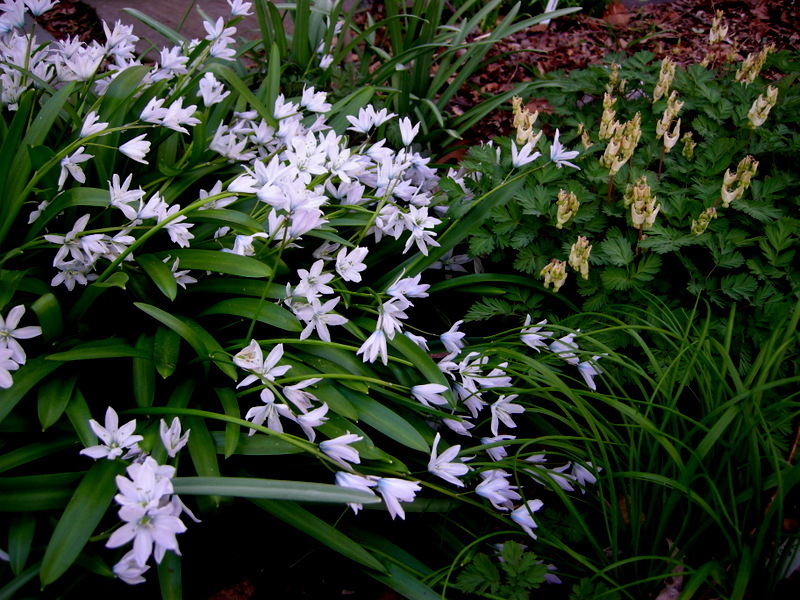 Dogtooth violet, Erythronium ‘Pagoda’, is a hybrid of two North American species. ‘Pagoda’ seeds around my woodland, and this is one of its seedlings. 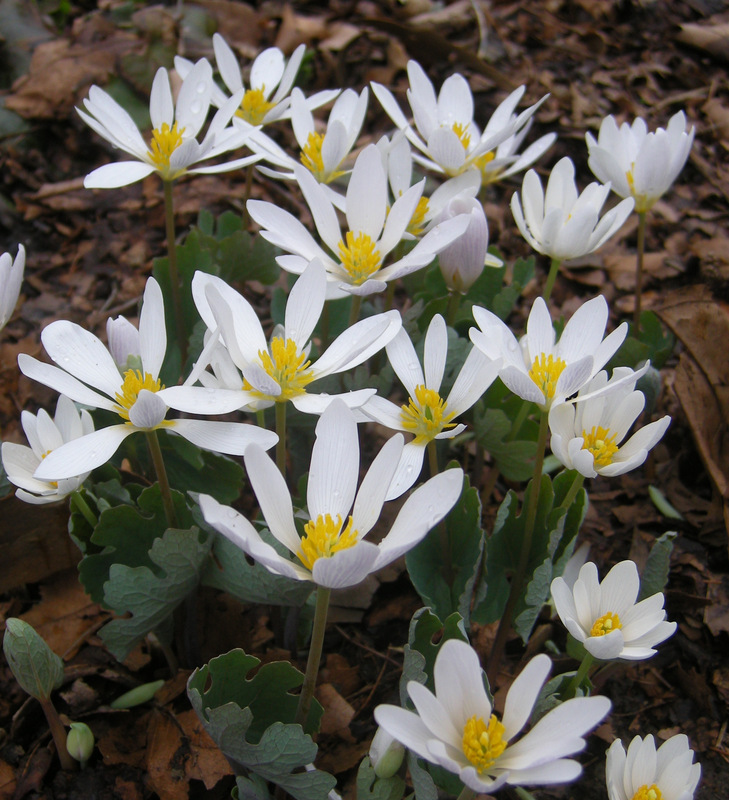 The single-flowered bloodroot, Sanguinaria canadensis, is quite lovely too. Both it and ‘Multiplex’, pictured above, have spread into large patches. 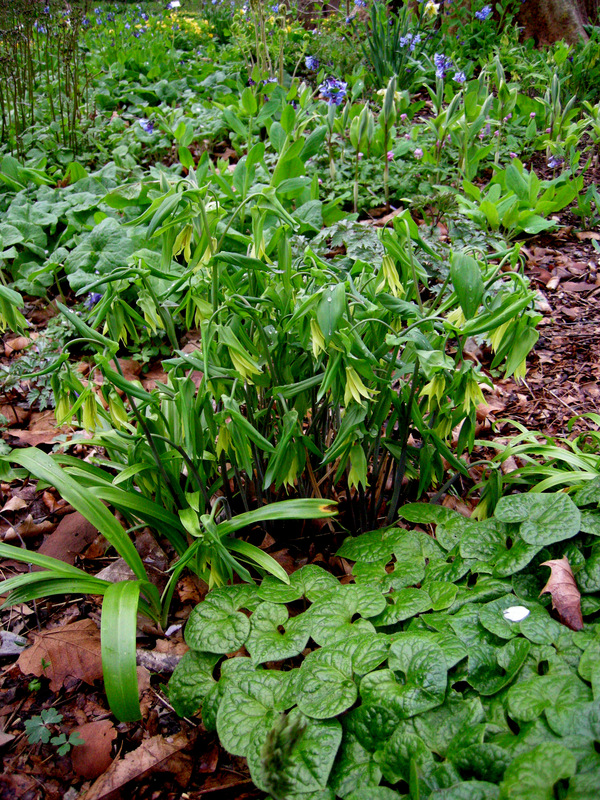 Large-flowered bellwort, Uvularia grandiflora, has very unusual yellow flowers. Shown here with British Columbia wild-ginger, Asarum caudatum, native to the U.S. west coast. My woodland wouldn’t be complete without mayapples with their beautifully patterned, umbrella-like leaves, incredibly fragrant flowers, and “apples” in May. However, they do spread quite quickly and are better used as one of the colonizing plants in my first post—give them room. Every woodland needs lots of ferns! 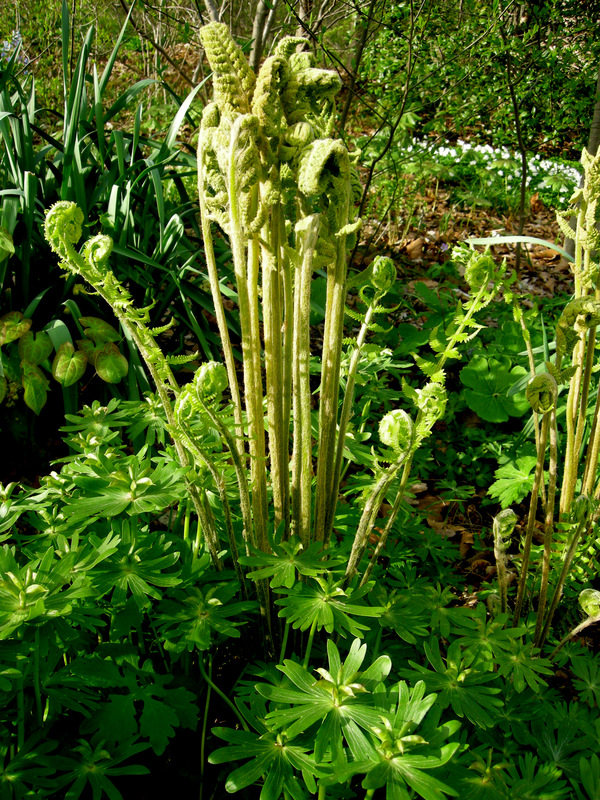 Pictured here is cinnamon fern, Osmunda cinnamomea, but I also have Christmas, royal, and ostrich ferns in my woods, among others. In the flood plain down by my creek, ostrich fern has successfully out competed my nemesis, the incredibly invasive, non-native Japanese knotweed. In drier woods, ostrich fern’s spreading tendencies are kept in check. Yellow violet, Viola pubescens, spreads almost as well in my woods as the white violet recommended in my woodland post, and you can’t beat the crayon yellow flowers. Dutchman’s breeches, Dicentra cucullaria, never fails to bring out the child in me with its little pairs of pants swinging in the breeze. 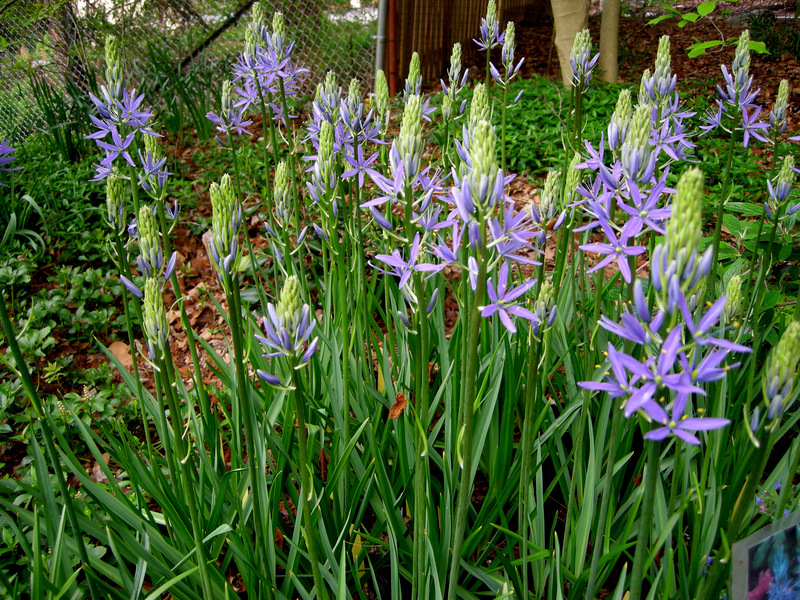 Large camas, Camassis leichtlinii ‘Caerulea’, is native to western North America not the mid-Atlantic, but it does so well in my woodland that I have included it here. 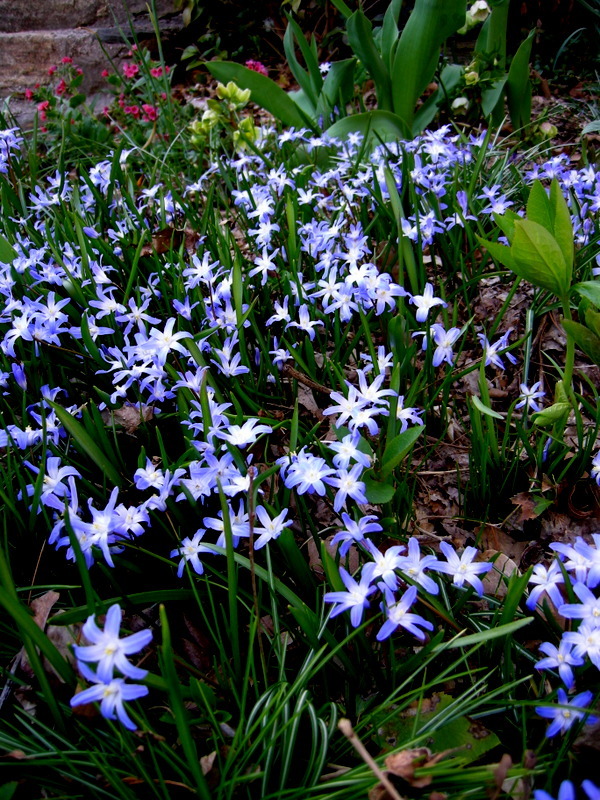 The large clumps of tall blue flowers line the back of the beds. 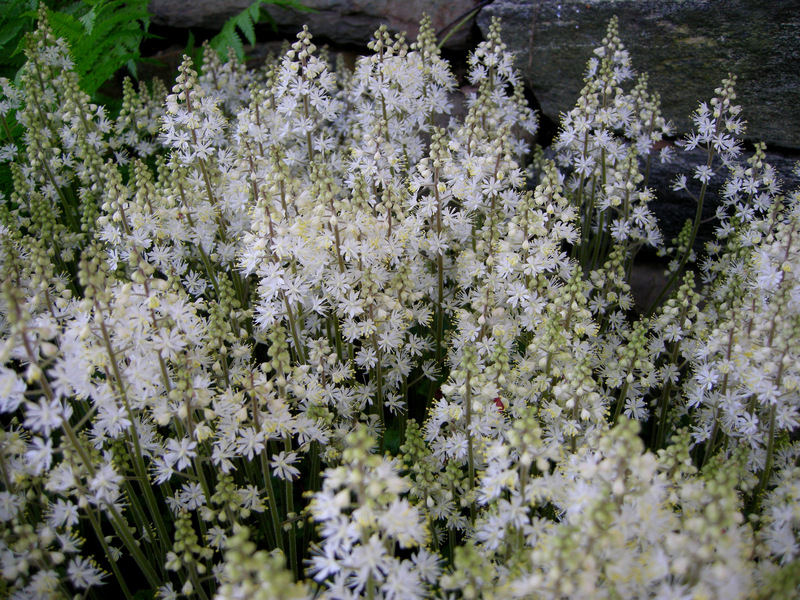 Foamflower, Tiarella cordifolia, is a star of my woodland garden with its wonderful fragrance, interesting leaves, and red fall color. There are many cultivars available, and I recommend choosing a spreading form: cultivars in the “River Series” are particularly vigorous. 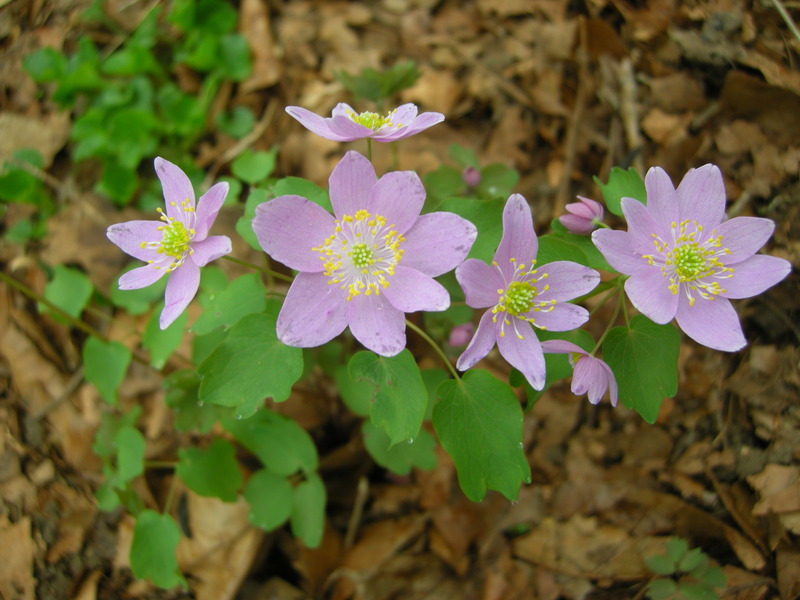 One of the loveliest native flowers in my woods is rue-anemone, Anemonella thalictroides (photo used with the permission of Arrowhead Alpines). It looks so dainty, but it is tough as nails and seeds around freely. There are many forms of rue-anemone, but my favorite is this luminescent single pink. 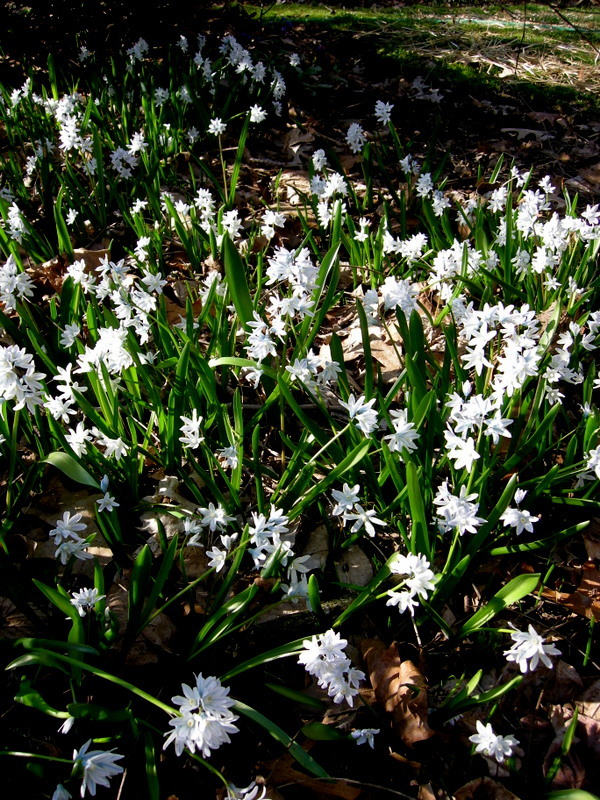 You can’t go wrong when you add any of these wonderful native plants to your woodland. They are ‘tried and true’ in mine! Nursery Happenings: The third annual Great Hosta Blowout where you can order beautiful hostas for a bargain basement price is going on now until April 25. To see the catalogue, click here. My third Open House Sale, featuring hostas, ferns, and hardy geraniums, will take place on Saturday, May 12, from 10 am to 3 pm.